Ascended Fanon: Dahlia Hawthorne's nickname "Dollie" is a reference to a fan effort to translate the GBA version of Trials and Tribulations (which only managed to cover the first case before the official localization was announced). In said fan translation, Dahlia Hawthorne was called Dolores Willow, and her nickname was "Dolly". Bonus Episode: "Rise from the Ashes". It was made as this for the DS version to show off some of the DS' features. Although other ports that include this episode have some of those features changed to fit the platform. The Cast Showoff: In the movie adaptation, Mirei Kiritani as Maya plays piano during the recess preceding the retrial of the DL-6 Incident. Marth Debuted in "Smash Bros.": An inverted example. The Blue Badger officially appeared in this game during "Rise From the Ashes" before going on to appear elsewhere (such as Wocky's "Bad Badger" shirt or as the mascot for Gatewater Land in Ace Attorney Investigations). However, in Japan, the fifth case was only added after the third game had been released when the original game was ported to the DS, meaning that "Taiho-kun" (the Japanese name for the Blue Badger) had already appeared on Maggey's shirt in the first case of the second game. To western players, it looked like the Blue Badger went on to become a sensation after Case 5 (which led to the production of t-shirts by the time Case 2-1 rolled around), but for keen-eyed Japanese players, it was evident that the developers were expanding on the design they had put on Maggey's shirt. Of course, this is if we assume that no one found the badger doll next to the chief of detectives in 1-4. No Export for You: Despite EVERY other game being released and despite even getting a few prerelease reviews in gaming magazines, Trials and Tribulations was never released in Australia. No reason was ever given (although it may be related to the fact that its release was delayed in Europe over ratings complications, causing Apollo Justice to come out before it). At least Australia got the Wii Ware version. The compilation Phoenix Wright: Ace Attorney Trilogy HD was released for iOS and Android in Japan, but other countries only got it on iOS for some reason despite every subsequent mobile release being available on both platforms in all regions. The live-action film has seen little international release outside of Japan other then Austrailia and Germany, other then a few film festivals. Port Overdosed: To list: there are versions of the first three games for Game Boy Advance, Windows, Nintendo DS, Wii, Nintendo 3DS, Android, iOS and Nintendo Switch. That's four generations of Nintendo consoles that had the original trilogy released in some way or form, as well as desktop computers and mobile devices. Remade for the Export: The original game's localized release is not a 1:1 port of the Game Boy Advance version of Gyakuten Saiban due to the addition of "Rise from the Ashes", hence why it was released in Japan as "Gyakuten Saiban: Yomingaeru Gyakuten" (the subtitle being used as the Japanese title of the fifth episode). The second and third games were straight ports. Tribute to Fido: The police dog in the first game is named after Missile, the creator's Pomeranian. He doesn't do anything useful, but taking him to Larry means he eats all of his hot dogs. 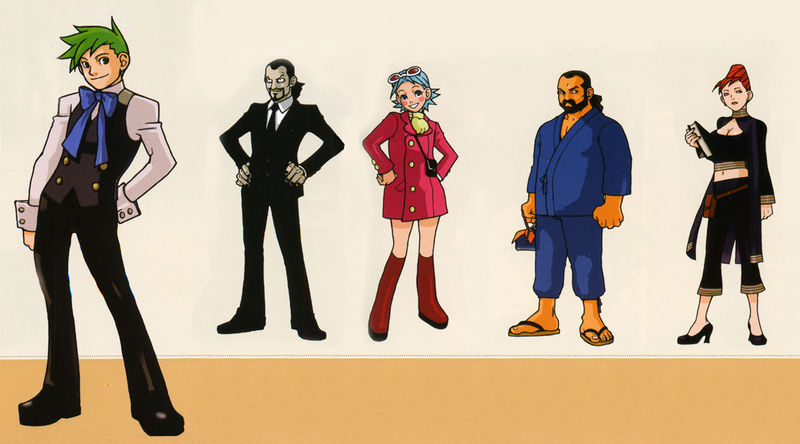 In-universe example: at the end of 1-4, Phoenix thinks he would've been a prosecutor because Larry framed him for stealing lunch money, and Edgeworth thinks he would've been a defense attorney if his actual father wasn't killed by the man who would become his adoptive father and mentor. There's a fan fic based on this premise. The main character would have bright green hair and Franziska's sense of fashion. The rival would looked like a young Manfred von Karma and had a pointy Beard of Evil. The mentor would be a big, hulking man. The assistant looked more like Ema. The detective would be a hot woman. An early concept for Wendy Oldbag gave her a much younger Brawn Hilda look. This page was last edited on 7 May 2018, at 14:12.